Up to 44 percent of students at for-profit colleges could lose access to federal financial aid under proposed “gainful employment” regulations, according to a new report from the sector’s trade group. And many of those students lack other educational options in their academic field or geographical area. The Association of Private Sector Colleges and Universities (APSCU) commissioned the study. Jonathan Guryan, an economist at Northwestern University, and Matthew Thompson of Charles River Associates, a consulting firm, are its authors. Guryan and Thompson argue in the report that the proposed rules fail to account for the relative lack of wealth and academic preparation of the students for-profits serve. The regulations also do not factor in the economy’s ups and downs. Likewise, the report said the department and White House are wrong to focus the metrics for their for-profit crackdown on the earnings and debt of students in their first few years out of college, which the report said tell an incomplete story about the value of the credentials students earn. The 103-page document is part of a final blitz  of lobbying by both sides  of the for-profit debate. The U.S. Department of Education released  a draft version of the rules in March. The period for weighing in with public comments on the proposed language closes today. The for-profit association plans to submit its official comments by today's deadline. But Guryan and Thompson’s report, which the co-authors submitted as a public comment, is a key part of the industry’s response. “It’s a serious effort to push back against the regulations,” said Kevin Kinser, chair of the educational administration and policy studies department at the State University of New York at Albany and an expert on for-profits. Gainful employment is an attempt to set minimum debt-to-earnings and loan-default rate thresholds on vocational programs at for-profits, community colleges and nonprofit institutions. However, the only degree programs that would fall under the regulations are housed at for-profits. The report’s authors found that many more students would lose federal aid eligibility under the rules than the department has estimated. Between 13 and 22 percent of covered programs at for-profits would fail, according the report. Those programs enroll between 23 and 44 percent of the sector's total enrollment. Because of gainful employment, the study found, more than 2 million students at for-profits would lose access to federal aid during the next decade. That is double the department's estimate. And the report found a potential high end of as many as 7.5 million students losing aid. The discrepancy between the estimates in the report and by the government, the report found, is due in part to department's overly optimistic view of students' ability to transfer to unaffected programs. The report’s broader point about the lost student access is that underserved student populations would take the biggest hit, including those from low-income and minority groups, as well as female students and veterans of the U.S. military. The argument of a disproportionate effect on minority and other underserved student groups could be a part of a predicted legal challenge by the association and for-profit-college industry to gainful employment, experts have said. A federal judge in 2012 halted  a previous attempt by the Obama administration to set similar rules. The judge wrote that one of the proposed metrics was set in an arbitrary fashion. However, the ruling also said the feds were well within their rights to pursue gainful employment standards for vocational programs. The report takes aim at an aspect of this round’s metrics that for-profits might claim as evidence of arbitrariness. It said the two measures do not overlap in the programs they would fail. In fact, the metrics are negatively correlated, according to the report, which means programs are more likely to pass one if they fail the other. 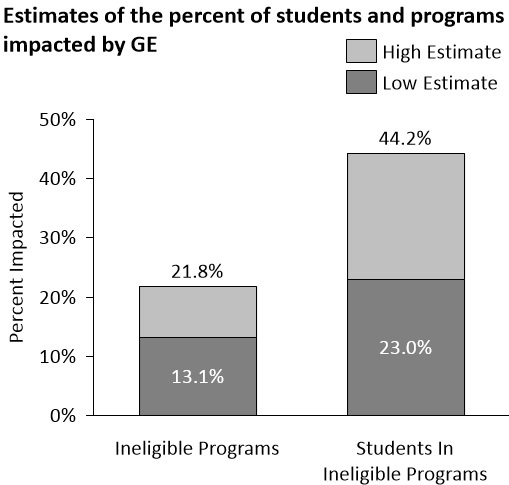 About 1,500 academic programs would fail at least one measure. But only 94, or less than 1.2 percent of all those covered, would fail both. If gainful employment is about identifying low-quality offerings, advocates for the for-profit sector said the two metrics should snag more of the same programs. “In this version of the regulation the department departed its previous position that the gainful employment metrics must work together,” Noah Black, a spokesman for the for-profit association, said in an email message. Over all, Kinser said there “wasn’t very much new” in the report. And while he said Guryan and Thompson go to great pains to detail the relative disadvantages of students that attend for-profits, he said he was underwhelmed by the defense of how the industry serves those students. “I would expect more of a recognition that they’re dealing with an at-risk population,” he said, adding that at-risk students need extra supports. William G. Tierney agreed. Tierney, a professor of higher education at the University of Southern California, said while the report makes "good academic points," it also ignores real problems. While it's fair to say poor students typically have more debt because they are poor, said Tierney, many lower-income students "accumulate far too much debt, and they accumulate this debt largely by attending for-profits." However, Kinser said, the new report performs a service by making the case that many students who are displaced by gainful employment’s penalties would have a hard time finding another institution to attend. Students may not be willing to attend a different area of study or to transfer to another college if their program is shut down, the report said. Even if they are willing to transfer, similar programs at other for-profits might also fail gainful employment. And there may be no alternatives at nearby nonprofit institutions. For example, just 12 percent of students who are enrolled in certificate programs at for-profits have nonprofit alternatives (certificate programs in the same field of study) in their ZIP code, according to the report. That number rises to 18 percent for associate-degree programs. In an interview, Guryan said the department underestimates the number of students who would be displaced by gainful employment, as well as the difficulty they will face in enrolling elsewhere. The only way that even half of displaced students will find another option in higher education, he said, is by “assuming enormous moves geographically and programmatically.” That means many students would have to abandon their studies under gainful employment. Kinser has a more positive take on gainful employment’s impact. He thinks for-profits will be forced to step up their game. Doug Lederman contributed reporting for this article.